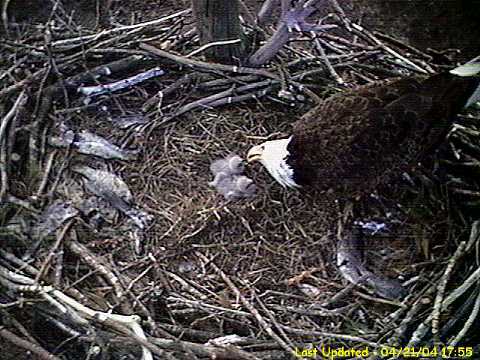 Eagle eggs hatch one to several days apart depending on when they were laid. Eggs hatch consistently after 35 days of incubation. 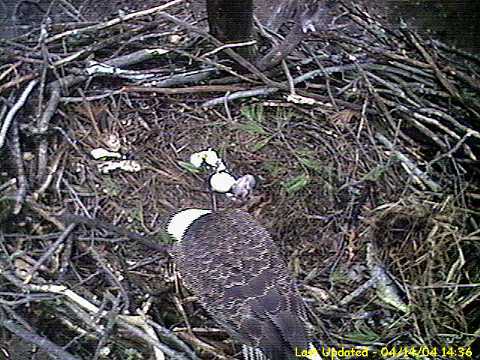 About 4 days before hatching the chick develops an egg tooth at the top of its bill. From inside the egg the chick pokes a hole in the membrane separating it from the air bubble at the top of the egg shell. Still inside the egg, the chick takes its first breath into the air bubble. and draws in its first breath. This bit of air will provide energy to scratch a hole through the egg shell to the outside. The hole poked through the membrane is called the internal pip. The hole pecked through the egg shell is called the external pip. After breaking the membrane with its egg tooth the chick can breathe the air that filters through the porous egg shell and vigorously starts the final process of hatching. The chicks hatch from the eggs without any help from the parents. The chick uses its egg tooth to scratch around the inside of the shell in a circular path. The scratches weaken the shell in a pattern all around the egg. This is called pipping, and it can take from one to two days. When pipping is completed the chick gives a few expansive bursts and the shell opens up. 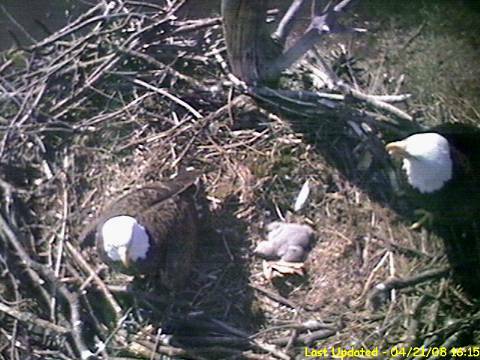 The chick is hatched! During hatching, a chick must undergo several physiological adaptations. Before it hatches, a chick absorbs oxygen through the shell by way of the mat of membranes under the shell. During the hatching process, the chick must cut the blood supply to these membranes and trap the blood within its body. The chick must also absorb the yolk sack into its body and inflate its lungs for survival outside the egg. Once the chicks hatch, the parents don't get rid of the shells. The broken shells sit at the bottom of the nest sometimes for a long time before getting crushed into tiny pieces. If eggs don’t hatch, adults will initially continue incubating, then start spending longer periods off the eggs and eventually give up.